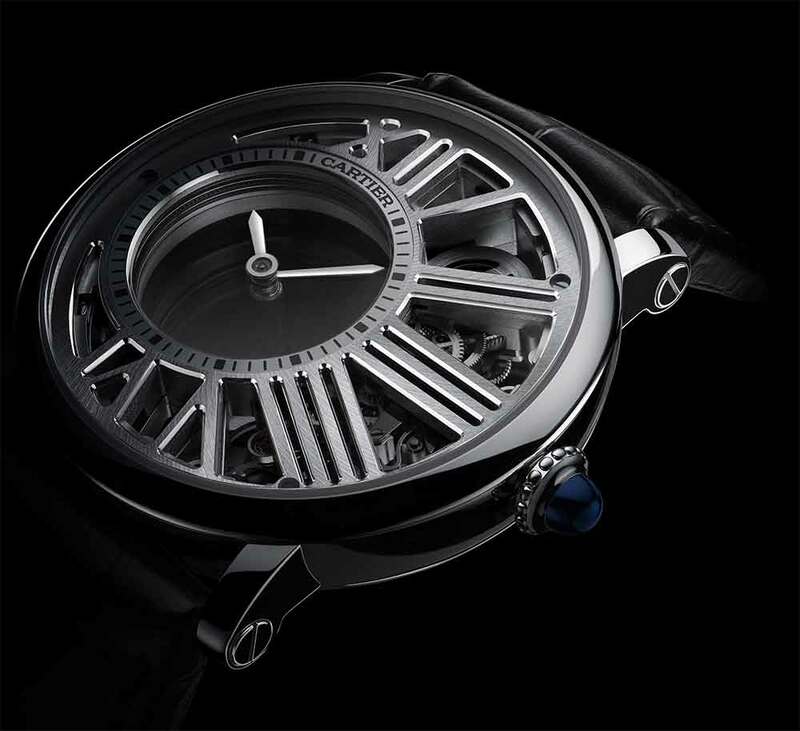 One of the features of Cartier’s high-end watches is skeletonization, with bridges in the form of giant Roman numerals. 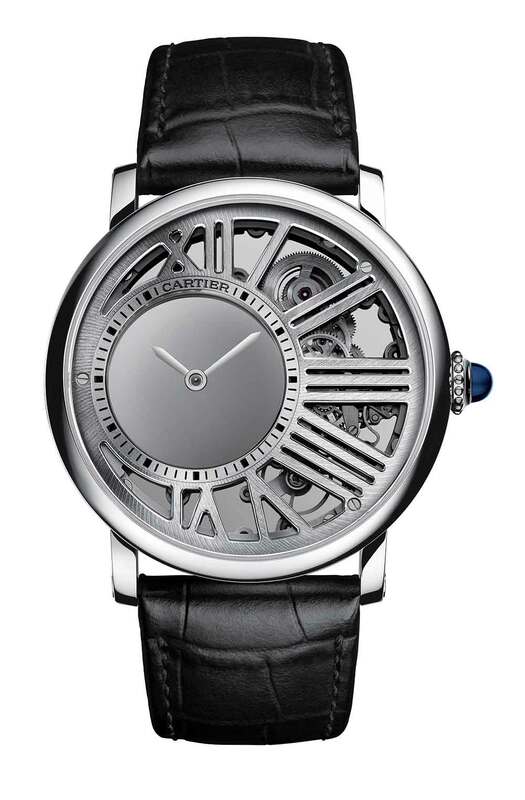 In this piece, presented as a preview of the brand’s new products to be launched at the watch fair SIHH which starts on 16 January 2017, Cartier combines its signature skeletonization with another of its specialities, the mysterious movement. The hour and minute hands seem to be floating in mid-air with no apparent connection to the movement. This is made possible by the use of two sapphire discs, with teeth around the edge, cleverly hidden so you don’t see the trick. The rest of the movement, Calibre 9983 MC, is substantially visible both from the front and through the sapphire caseback. 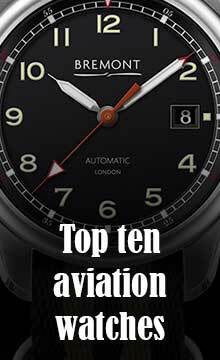 It’s all brilliantly done, with the contrasts between the gears in the right-hand crescent and the empty space of the hour and minute display. The watch has the Rotonde de Cartier case in palladium, 42 mm in diameter, 11.9 mm thick, water resistance 30 metres, with a sapphire cabochon set into the crown and representing the only touch of colour. The sapphire discs driving the hands are opalescent to prevent the view being disturbed by the dreaded wrist hairs. The Calibre 9983 MC has 192 components and runs at 28,800 vibrations per hour, 4 Hertz. It is hand-wound, with a power reserve of 48 hours. 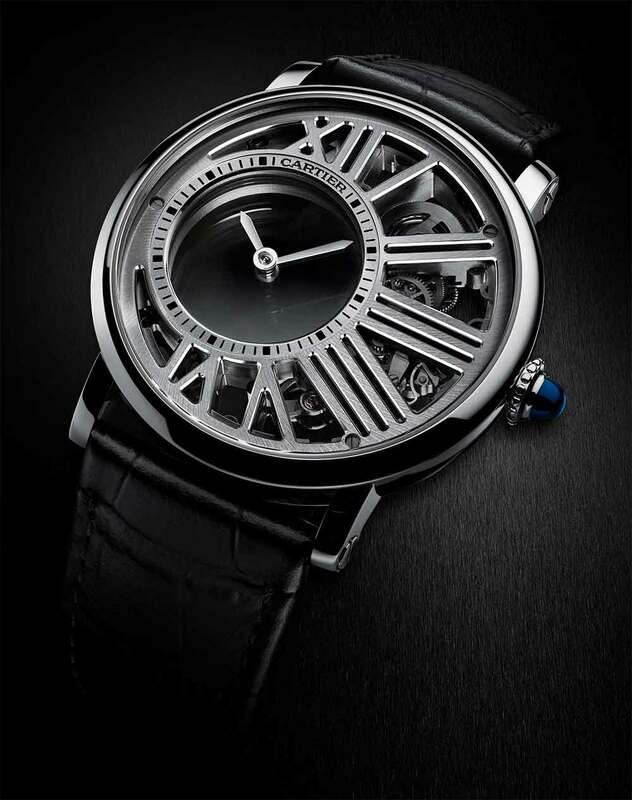 The Rotonde De Cartier Skeleton Mysterious Hour Watch is reference WHRO0014, price €60,000 plus VAT. Read more about Cartier at their website.